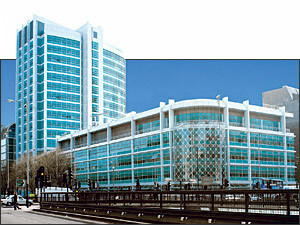 University College London Hospital, UCLH, in the UK is known for its innovation and its high-tech facilities. Its gastroenterology unit is a vanguard in the use of video for visualization of the digestive tract, and its endoscopy suite, one of the earliest established specialist endoscopy units in the UK, has used live camera feeds of clinical images for years. These live feeds have allowed department trainees in seminar rooms to be fully in touch with medical procedures taking place in remote clinical rooms. UCLH's gastroenterology unit needed a system capable of showing seven images on one screen: one dominant center window and three smaller images along each side of the main image. The seven windows would be used to view two operating rooms and the associated patient data, x-rays, and live endoscopies, with full audio between the viewing and operating rooms. Several choices of images are available in modern endoscopic procedures. For example, there are the live images from the gastroscope, endoscope, fluoroscope, microscope, radiology, and ultrasound. UCLH's gastroenterology unit needed these images, as well as the ability to view patient vitals and PACS - Picture Archive and Communication System graphics displayed on the same screen. In addition, all system control had to be within the seminar room where the department trainees were participating in endoscopic procedures. As the teaching hospital prepared to move to a brand new facility, Video South Medical Television, a UK company at the forefront of medical AV technologies, had a clear vision of what it wanted for the gastroenterology unit's AV system, but it wasn't certain how the multi-image display would be accomplished. Enter the MGP 464 DI, Extron's Four Window Multi-Graphic Processor with DVI Inputs. Video South considered and tested products from two other manufacturers, but neither could give the integrator exactly what it needed, including assurances that the system wouldn't lock up with the constant changing of signals that is the norm in live medical procedures. "We had been working on the multiple window concept before the MGP 464 became available, and we had done a lot of work to lower the risk of failure due to using other devices that might not be appropriate," said Alistair Holdoway, Managing Director of Video South Medical Television. The integrator wanted to use a 1080p-only display, but experience had shown that problems could ensue when working with mixed inputs (composite, RGBHV, monochrome), especially when these inputs are suddenly removed during live medical exams. "We were almost halfway through completing the installation when the MGP 464 became available, and I realized that it was exactly the device we needed," Holdoway said. UCLH moved to this new facility in late 2005. With its high-performance scaling engine, the MGP 464 solved problems that occur in many systems when signals change frequently. "Many users don't realize the difficulty presented by the fact that feeds come and go," Holdoway said. "When physicians finish five minutes of work with x-ray or ultrasound equipment, they turn it off, which can cause major sync problems in windowing devices locked to incoming syncs." The MGP 464 eliminates these sync issues; there is never a loss in signals. The system includes an integrated input switcher so that various sources can be smoothly interchanged without glitches or signal interruption. For Holdoway, a key deciding factor in choosing the MGP 464 was the unique ability to daisy-chain multiple MGP 464s via DVI to allow the digital output from one processor to the digital input of another to create 8 or more windows on screen. The MGP 464 facilitates an almost infinite number of picture-inpicture configurations, and with two MGP 464s, as many as 38 sources, 19 from each MGP 464, and up to 8 windows, are available. Depending on the need and application, an additional MGP 464 unit may be cascaded to create a 12-window display. Each window can display virtually any analog or digital video source, from composite video to HDTV and computer-video. "We use one MGP 464 to compile a set of images, feeding its digital output to the digital input of a second MGP 464 and overlay another four images so that we can view seven images together," Holdoway said - See application diagram below. The all-digital DVI link between the MGP 464s ensures the best possible image quality when cascading two or three MGP 464s together. The endoscopy department's previous installation had a multimedia seminar room, which was also linked to four endoscopy rooms for live demonstrations of procedures. The viewing of various images was achieved with a wall of monitors, similar to the setup in television studios. This setup was adequate for awhile, but Video South Medical Television welcomed the opportunity to upgrade the department's AV installation with the move to the new building. A total of 128 default memory presets for picture-in-picture window configurations are available, including 30 that are factory-preloaded. These can be customized for quick saving of configurations and recall of size, positioning, and priority. Once Video South created and saved the settings for UCLH's endoscopy department, they could be recalled by touching various buttons on the touch panel. Holdoway said that flexibility was very important for the hospital installation, and the MGP 464 delivered. "Instead of having a wall of six or seven monitors, I wanted one widescreen projection screen, which is much more elegant. It saves a lot of space and a lot of power and there's much more flexibility. With a wall of monitors, the images were stuck at one size, but with the MGP 464, and a very clever touch panel control that we developed for it, any image that becomes particularly important at any juncture can be magnified to full screen with the touch of a finger. This is extremely functional for live medical procedures," Holdoway said. With a touch panel programmed through the MGP 464's IP Link Ethernet control, the user can click to a clinical room or two clinical rooms and show any of the images from those rooms in any of the windows created on the screen in any desired arrangement. Dr. Adrian Hatfield, head of Endoscopy at UCLH, couldn't be more pleased with the system. "The new 3-meter (10') wide HD projection wall has been an outstanding success," he said. "Having previously been used to a central screen and six surrounding monitors, we now have the luxury of one large screen on which we can display up to seven image windows of selectable size. We can instantly choose, with the help of the touch panel, whether to view one full screen image, a dual screen arrangement, or one larger central view and six surrounding smaller views. We can choose the display 'screen' format and which image will be displayed in each window. The quality of the projected image, whether large or small, whether a detailed CT scan or live endoscopic view, is absolutely superb. This setup has revolutionized our routine case conferences for current patients, allowing easy display of x-ray and pathology, as well as live demonstration from the treatment rooms." The MGP 464 also addresses the potential for new or additional signal sources in the future. The system includes a virtual video input panel, which is designed to accommodate the full range of standard definition video signal types. Because much of the installation took place in the clinical rooms where endoscopy therapy takes place, it was sometimes difficult to work around physicians who were trying to use the room at the same time that Video South was installing the system. "It's a function of large hospitals that they are put into service the instant the builder says the paint is dry, even though a lot of functions of the facility are not complete," Holdoway said. "In reality, we could have completed the installation in six weeks; however, it took three months because we were working around people in the hospital." Holdoway said that without the MGP 464 DI it would have been very expensive to display seven windows of images from a variety of sources. "However, the MGP 464 does it well at a price we can afford," Holdoway said. "It is the best value for the money in this regard." With high-performance scaling engine to handle frequently changing feeds, its flexibility, and control system programming, the MGP 464 has made it easier for Video South to do what it does best: set up multiple picture arrangements in a preprogrammed format. Once the window configurations are designed, they are saved for later recall; the MGP 464 offers a total of 128 memory presets. Holdoway explained that there's an art to determining the size and order of images placed in the windows, and with the MGP 464, they're able to build that intelligence into the touch panel to make it easier for the user. This kind of technology has made a major difference in the field of medicine, according to Holdoway. "To be able to access any patient's radiological images simultaneously with the live display of therapy being conducted on that patient is a major advance. In the past, the physician would say, 'I'm showing you this patient's esophagus, and you have to take my word for it that this is a T3-stage tumor because I have the MRI scans on the wall, but you can't see them.' They were always apologizing for the poor quality of images that advanced students needed to see. Now, high quality images remain there in front of them while they watch live procedures. That makes a huge difference," Holdoway said. Late last year, UCLH held an open house for the new building. Those who attended included physicians and medical imaging suppliers who provide endoscopy and radiology equipment. According to Holdoway, some of them commented that they had never seen such an impressive system. "Many of these people have seen a lot of centers worldwide that have good imaging displays, and they agreed that this is an excellent system," Holdoway said. "They were very impressed, as are the physicians in the gastroenterology department." Photo courtesy of UCLH NHS Foundation Trust.